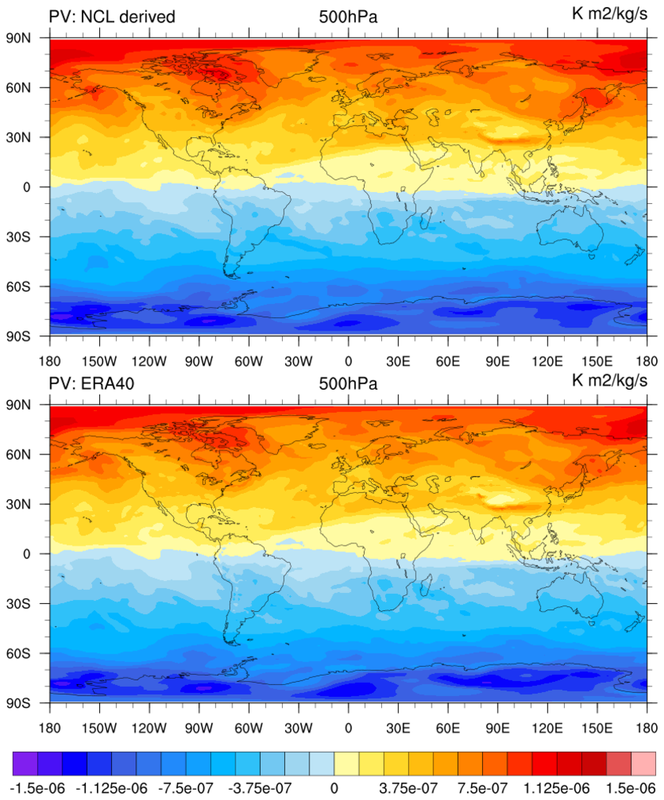 There are two potential vorticity (PV) functions in NCL. One for application on hybrid (model) levels (pot_vort_hybrid); the other for application on isobaric levels (pot_vort_isobaric). Embedded within these functions are functions to derive static stability and potential temperature. Several of the functions have an option for multiple results to be returned as part of a list variable. 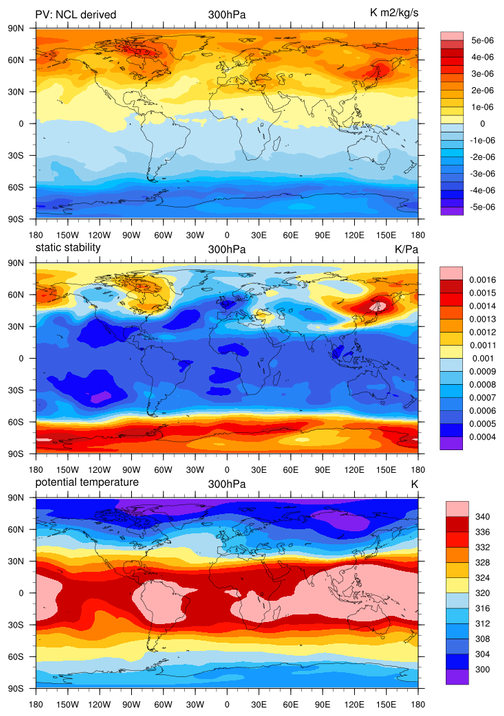 The data sets used are ERA40 monthly mean files available from NCAR's Research Data Archive (RDA): http://rda.ucar.edu/datasets/ds126.1/. PV is a non-linear quantity. Hence, the correct way to compute monthly mean PV is to compute it every time step and average the results. Computing PV from monthly mean U, V, T quantities will result in smooth results that may compare well in terms of patterns but will likely lack the detailed structure of the 'correct' monthly mean PV. 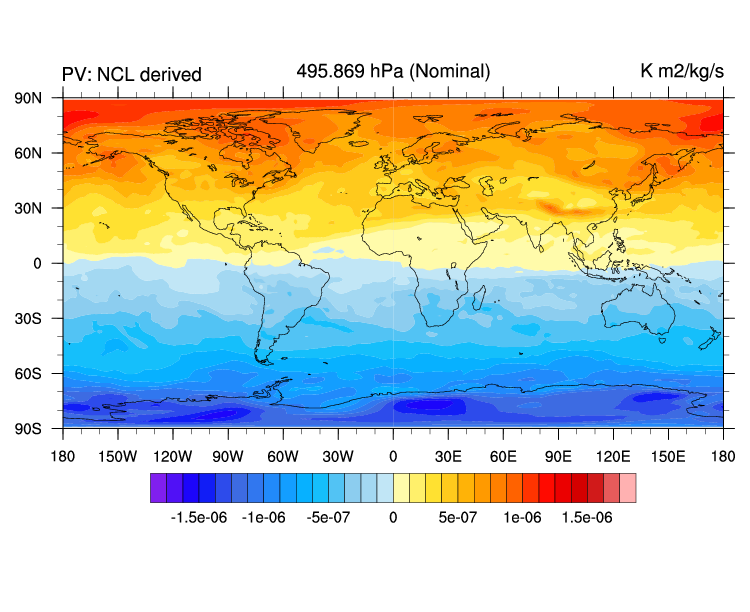 pv_isobaric_1.ncl: The top of each figure are the derived potential vorticity (PV) from pot_vort_isobaric. 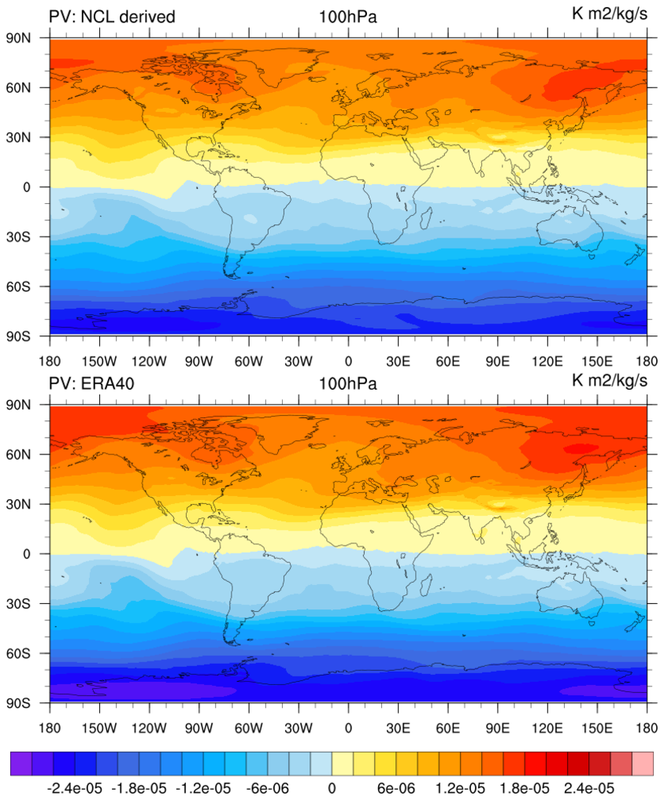 The bottom are the monthly mean PV provided by ERA40 which was calculated at ECMWF the 'correct' way. Hence, each has more structure. 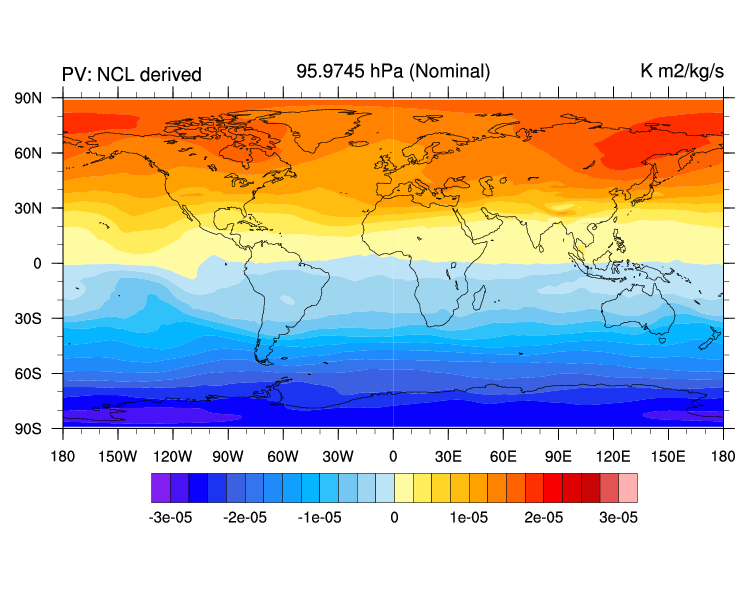 The NCL derived PV reflects that monthly mean U, V, T were used. If NCL's function was used on the (say) 6-hrly values and averaged, the results would likely mimic the ERA40 results. pv_isobaric_2.ncl: This example illustrates how to retrieve individual elements from a list variable returned by the pot_vort_isobaric function. Here, static stability and potential temperature are extracted. 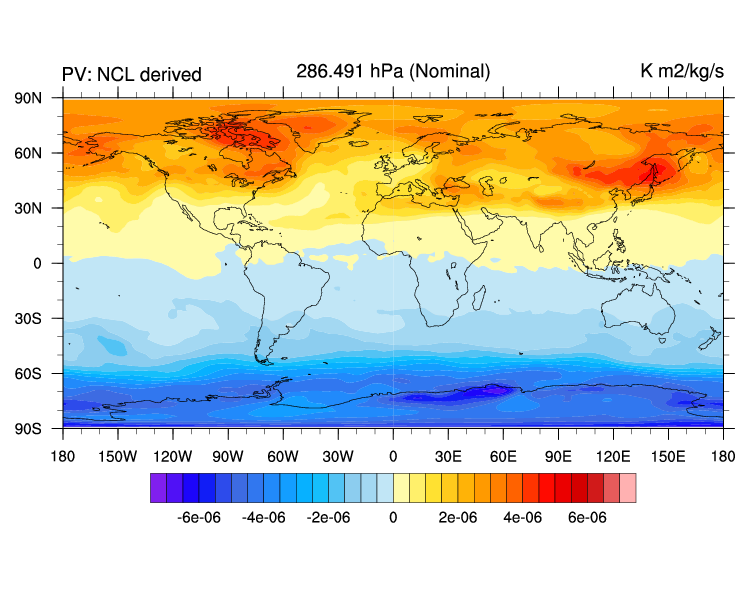 pv_hybrid_1.ncl: The top of each figure is the derived potential vorticity (PV) from pot_vort_hybrid. 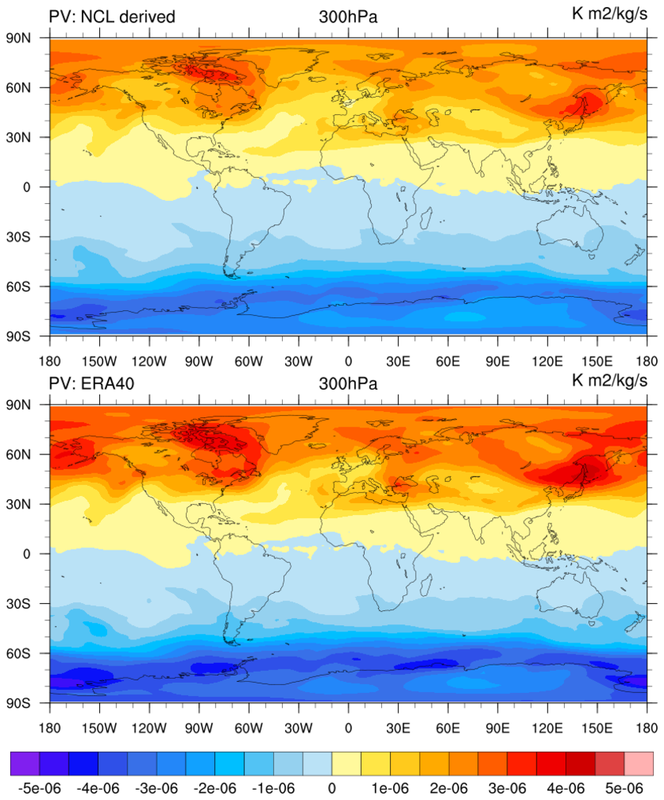 There are no ERA40 verification data sets.